Idea: A blank wall with sheets and a man with pale skin that camouflage with it. And then a painting that goes over his body as if he was part of the canvas. Now I'll just try to make a few speedy details. This was originally drawn by me in "pencil". Then it was scanned. And vectored in photoshop 7.0. The body of the man is completely vectored. The only part that wasn't was the "Coloring" of a very small part of the eyes and the airbrush on the lips and um chest.. This character was originally made to be part of the comic I've been working on. But I don't wanna say anything yet. I wanted him to have the look of a j-pop (or j-rock) idol. But no matter how many times, and i mean many, that I try to draw his hair or make the style for it, it never comes out like I want it to. This is a case of a bad hair day maybe? So, I browsed the net for male models, and on one of the sites, I found Yui. Who is female. Not male.They were just advertising her CD. So this is the picture I used for reference for his hair. This image gave me a general understanding of the hair style I wanted, but I'm gonna need a lot more reference to get it exactly how I want it for the comic. As for his body, I was completely on my own with that... No reference at all. The flowers were vectored without reference as well. And then it was painted. That was the last step after the vectoring. This was actually my 1st try at painting. It's sooooooooooo much fun. I can't believe what I've been missing. @w@ I'm still novice at it (obvious I am). And I'm nothing special in vectoring either........ But I definitely find painting fun in photoshop. So I hope I can paint many more drawings. (if i'm not worn out from classes). And hopefully I'll get better. TwT Let's hope, shall we? and all the awesome members there. Ever since the layout change, they've gotten into a bit of trouble. To explain it clearly, this group has helped MT for so long now. Their goal is to make MT beautiful. And so, for nothing in return but a simple thanks, they make userpages and group pages for people at their request. Right now they are looking to have more active members. If they don't know how to make userpages, HAVE NO FEAR. Melymay and the others are very kind and are doing the best they can to teach and make userpage customization easier. Right now, we're trying to collect codes for layouts that people use to make their page and content pretty. And then turning those codes into like a template. So people just save it in notepad or word and fill in the template easily and then stick it in their userpage content page (where u edit the html) and ta-daaaaaaaaa. The problem here is that the people trying to make this happen are very few. Active, hardworking, but few. They've made a lot of contributions to the site, so I hope that even if u don't know html and even if u don't want to make userpages and learn how and take up requests, that u at least support any way u can. Even if it's just by encouragement and advertising. Also, for those who really do understand some HTML, or have a general understanding of how to make and customize layouts, please lend us a hand. Melymay and the members are trying their best to adjust, but they need some help in understanding what does what. So if you can teach them a little, it'd definitely help. And now a word from our model. 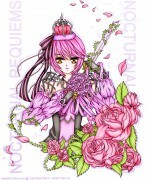 If u want to see more of my art, u can find links to my creative stem, deviantart, art bistro, etc. accounts on my profile page. Thank you, thank you, thank you, thank you, thank you, thank you, thank you, thank you, thank you, thank you, thank you, thank you, thank you, thank you, thank you, thank you, thank you, thank you, thank you, thank you, thank you, thank you, thank you, thank you, thank you, thank you, thank you, thank you, thank you, thank you, thank you, thank you, thank you, thank you, thank you, thank you, thank you, thank you, thank you, thank you, thank you, thank you, thank you, thank you, thank you, thank you, thank you, thank you, thank you, thank you! Looking at just the thumbnail, it looks a bit plain, but on full view, I think the flowers and the head of Mr.Naked-Man are very well done. I think if you defined the shadows of the sheet(s), the vector will have more depth. I know you went through a lot of effort into the outline, but in my opinion, if you're going to vector, you should stick with smooth lines, especially for bare skin. Otherwise, you should just keep everything consistent, i.e. either everything in smooth or everything sketch style.